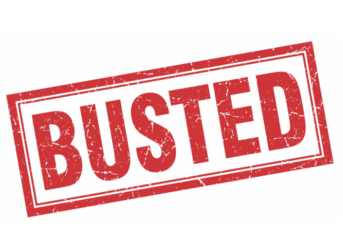 5 Tire Sealant Myths Busted! Think you know everything there is to know about tire sealants? Maybe not. Read below as we bust some of the common myths floating around about tire sealants! Busted! Most people understand how valuable tire sealants are in an emergency flat tire situation. But most people don’t realize that some tire sealants can also PREVENT flat tires in non-highway vehicles (such as bicycles, ATVs, trailers, tractors, riding lawn mowers and more) for up to 2 years! A prevent and repair sealant (rather than an emergency sealant) is designed to be pre-installed before you begin your fun to stop flats before they happen. Use the Slime sealant with the yellow label (emergency use) when you get a sudden flat tire in your car, truck and SUV. Use the Slime sealant with the red and blue labels (prevent and repair) to prevent flat tires for up to two years in your bicycles, ATVs, trailers, tractors, riding lawn mowers and all other non-highway vehicles. Myth No. 2: Tire sealant is toxic! Busted! Since Day 1, Slime sealants have been environmentally friendly and non-toxic, all the way down to the black specs of recycled tires floating in our formula. Our signature green color stands for more than just our brand – it also demonstrates our commitment to creating products that are safe for our customers, their tires and the environment. Busted! Slime’s tire sealants clean up easily with water. So whether you are removing sealant from your bike, ATV or trailer at home, or your auto mechanic is wiping the sealant out when repairing your flat, all it takes is a clean cloth and a bit of water to clean up the Slime. Busted! Slime’s tire sealants are specifically designed to be Tire Pressure Monitoring System (TPMS) safe (look for the TPMS safe icon on the bottle!). Our sealants undergo rigorous testing to ensure that your tire sensors are safe when Slime is installed. Busted! Slime tire sealant is specially formulated with rust and corrosion inhibitors that work to protect the integrity of your finished metal rims. In automobiles, we recommend removing the tire sealant and repairing your flat tire within 3 days or 100 miles. In non-highway vehicles (such as bicycles, ATVs, trailers, farm equipment, etc. ), Slime’s tire sealant will prevent flats for up to 2 years without causing damage to your rims. 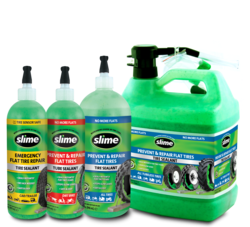 Slime tire sealants are designed to be easy to use, safe for consumers and the environment and designed to keep your wheels moving. No more flats with Slime! I have had Slime fitted in my tyres. I feel the pressure is too high. If I reduce it will I have to change the tube? Will the slime clog the valve? The pressure is 65psi.